ounder and Chair of the ruling Georgian Dream (GD) party, billionaire Bidzina Ivanishvili, has released a statement evaluating the country's path since April 9, 1989 and summarizing the results. Ivanishvili’s statement reads that 9 April was one of the most tragic days in the history of Georgia, but that the day has become a symbol of Georgia's struggle for freedom and independence. The day which Ivanishvili speaks about this year celebrates the 30th anniversary of the April 9 1989 tragedy, when the Soviet Union's armed forces dispersed a peaceful demonstration in the center of Tbilisi, resulting in 21 deaths, 17 of which were women. The country also marks the 28th anniversary of its independence from the Soviet Union. GD Chair said. Ivanishvili's statement reads that on 9 April 2012, after 21 years of independence, Georgia had “overcrowded prisons, suppressed media, occupied territories and a cynical model of oriental tyranny" and claims that on 1 October 2012, the Georgian people “gained an incredible victory and the violent regime was removed without civil confrontation or a revolution.” “For seven years now, the country has been governed by a policy of rationalism that brought a continuous foreign and civil peace that is unprecedented in the history of independent Georgia,” the statement reads. Ivanishvili also says the authorities that came to power after the October 2012 elections provided a “high standard of democracy and increased the level of political rights.” “It is unimaginable to fall back to the past. The only option is a rational policy, development, and democracy. The irreversibility of the advancement of the Georgian state is based only on the unification of society,” he wrote. @entrepreneur.ge Gamarjoba! 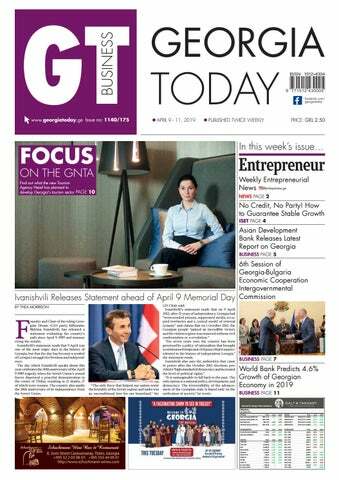 I’m the Editor-in-Chief of the Georgian edition of Entrepreneur magazine and I’m here to share the top weekly Entrepreneurial news with you: Erti Kava café’s story began in Mestia two years ago when Tania Merzalia was travelling through Georgia with friends. Admiring and inspired by the country, its mountains and a love of coffee, the girls decided to start a business in Georgia. They had no idea about the marketing, but they took a risk and succeeded; producing well-loved coffee for mountain enthusiasts. A second branch of Erti Kava has been opened in Tbilisi, where guests can choose from 15 different coffees and Georgian teas. The coffee is European, the theme and interior Georgian. The girls now have their sights on Sighnagi and Batumi. the EaP ministerial meeting to be held in Brussels on May 13. The Foreign Ministers will discuss the future of the EaP and review the implementation of the EaP's 20 deliverables for 2020. The Eastern Partnership is a joint initiative of the European External Action Service of the European Union together with EU, its Member States, and six Eastern European Partners governing its relationship with the postSoviet states of Armenia, Azerbaijan, Belarus, Georgia, Moldova, and Ukraine. HIGHLIGHTS • ISET-PI’s forecasted real GDP growth for the first two quarters of 2019 remain at 4.3% and 4.6%, respectively. • Geostat has released its rapid estimate of real GDP growth for February 2019. Their estimated growth stands at 4.6%, while the average real GDP growth for January-February 2019 reached 4.1%. • Based on February’s data, we expect 2019 annual growth to be 4.4% in the worst-case or “no growth” scenario, and 5.5% in the best-case or “average longterm growth” scenario. Our “middle-ofthe road” scenario (based on the average growth over the last four quarters) predicts 4.7% real GDP growth. Based on data from February 2019, our forecast for the first two quarters of 2019 has not changed significantly. The majority of explanatory variables in our model have remained quite stable throughout February. The most meaningful changes were observed in those variables related to the Deposits of Various Maturities in Commercial Banks, Monetary Aggregates, Consumer Credit and the External Sector. new lending regulations could potentially have a negative impact on shortterm growth predictions. In February 2019, the Total Volume of Commercial Banks’ Consumer Credit increased by only 0.2% monthly and 3.5% yearly. However, the Credit Volume of Commercial Banks' Short-Term Consumer Credits reduced by 1.3% and 59.3% in monthly and yearly terms, respectively (the main driver behind this negative trend being consumer loans in the national currency). Whereas, the Credit Volume of Commercial Banks' Long-Term Consumer Credits increased by 0.3% monthly and 16.4% yearly. Overall, the variables related to consumer credit have had a slightly negative impact on the growth forecast. the previous year. According to the preliminary data, released by the National Statistics Office of Georgia (Geostat), the key reasons behind decreasing FDI were the completion of a pipeline project (implemented by British Petroleum), transferring ownership to some companies from non-resident to resident units, and the reduction in liabilities to nonresident direct investors. Furthermore, the economic sectors chiefly depressing FDI growth were transport and communication (-18.5 ppt), construction (-15.4 ppt), and energy (-11.4 ppt), where the only sectors that positively contributed to growth were hotels and restaurants (+2.1 ppt), and agriculture and fishing (+0.4 ppt). Due to data limitations (FDI statistics are published quarterly with a notable time lag), we are not able to take the FDI data into consideration in our econometric model. Therefore, the notably deteriorated FDI inflow might cause considerable downward pressure on our forecasted values. Our forecasting model is based on the Leading Economic Indicator (LEI) methodology developed by the New Economic School, Moscow, Russia. We constructed a dynamic model of the Georgian economy, which assumes that all economic variables, including GDP itself, are driven by a small number of factors that can be extracted from the data well before the GDP growth estimates are published. For each quarter, ISET-PI produces five consecutive monthly forecasts (or “vintages”), which increase in precision as time goes on. Our first forecast (the 1st vintage) is available about five months before the end of the quarter in question. The last forecast (the 5th vintage) is published in the first month of the next quarter. n April 7, a gas leak caused an explosion on the 4th floor of a residential building in Digomi Massive, underlining once again the need for stricter gas regulations and improved safety measures in Georgia. The Ministry of Interior has stated that seven people were injured in the incident on Sunday, including a 7-month old child. A 21-year old man is also in a serious condition in hospital with 35% burns as a result on the explosion which also caused part of the apartment building to collapse. This incident comes just months after four people were killed and eight injured after a gas leak caused an explosion on January 16 in the Digomi Massive district in Tbilisi. Over nine people have also died as a result of carbon monoxide poisoning in the capital so far this year. On January 21, two people died from natural gas intoxication in Varketili district, whilst seven died in an incident on Ketevan Tsamebuli Avenue on January 31. Speaking to reporters on April 8, Mayor of Tbilisi Kakha Kaladze said it is necessary to install detectors in residential blocks that will alarm residents in case of a gas leak. He affirmed that an agreement has already been reached with Ministry of the Economy and that regulations should come into effect by the end of the year. of course I will pay more attention.” However, the question remains if responsibility for the incidents lies with KazTransGas, the gas provider who supplies gas to Tbilisi. Prior to the deadly gas leak in January, two KazTransGas employees had carried out an inspection on the building. They were arrested following the incident. Following the explosion on Sunday, KazTransGas at first insisted that the leak occurred due to a gross violation of use by the residents. However, a criminal investigation is currently underway at the scene to determine the exact cause of the explosion. Gas leaks in Georgia are often caused by aging and outdated gas pipes and poorly fitted appliances. KazTransGas also reports that many residents remove gas installations from the network despite potential threats. In January, 2381 devices were stolen, whilst this figure stood at 2549 in February, according to KazTransGas. Following gas incidents, politicians and officials are fast to offer their condolences and call for tighter gas regulations. However, the number of casualties has yet to decline. In 2018, there were 16 cases of CO2 poisoning and 13 deaths related to gas leaks in Tbilisi, according to Irakli Bendeliani, Tbilisi’s Deputy Mayor. The death toll this year has already reached the same number in three months alone. Such figures raise the question whether enough is being done by KazTransGas and the government to prevent future leaks and more casualties. Stronger private sector involvement in training for entrepreneurship would help, as would efforts to encourage more women to enter business match in the labor market.” Inflation is expected to peak at 3.2% this year before tapering off in 2020 to 3%. If inflation can hold at or below 3% through 2020, the National Bank of Georgia is likely to begin gradually reducing its interest rates. The ADB has expressed concern for Georgia’s high credit growth rate, which it expects to decrease during the forecast period due to further regulation of the credit industry and rising standards of creditworthiness. Credit growth is estimated to be 13% in 2019 and 12.5% the following year. The report explains the importance of FDI in Georgia as a source of capital, due to low domestic investment and limited personal savings. Since 2005, the national FDI rate has nearly tripled. However, the ADB highlights, most FDI coming into Georgia is spent on existing, labor-intensive activities. The ADB would prefer to see more FDI going to more complex sectors of the economy with higher value added, such as manufacturing. One reason given for the difficulty of attracting FDI to Georgia is a shortage of qualified workers. In the vein of increasing investment in building a strong, well-educated workforce, the ADB insists that “stronger private sector involvement in training for entrepreneurship would help, as would efforts to encourage more women to enter business.” The ADB cautions that there are several risks that may drag the positive outlook of the forecast down, namely “external shocks and escalating trade tensions, tighter credit, rising global interest rates, difficulties in financial markets, or reduced capital spending.” Growth could in fact be higher than predicted, though, if key trade partners such as Azerbaijan and the Russian Federation improve their economic performance. ADB’s key development priorities in Georgia include fostering inclusive and sustainable economic growth, reducing poverty, enhancing regional connectivity, and improving public service delivery. ADB is committed to achieving a prosperous, inclusive, resilient, and sustainable Asia and the Pacific, while sustaining its efforts to eradicate extreme poverty. good company respects the law, respects and looks after its employees, respects and looks after the society in which it works, and respects and looks after the environment in which it exists; in short, it employs a good Corporate Social Responsibility (CSR) strategy. Milton Friedman, an American economist who received the 1976 Nobel Memorial Prize in Economic Sciences, once said, “There is one and only one social responsibility of business – to use its resources and engage in activities designed to increase its profits…” Modern business practices as well as societal and legislative demands are proving him wrong in his assessment of the purpose of a business. Transparency, accountability, reliability and green policy are the buzzwords here. Let’s have a look at them in more detail. gian customers are only now waking up to the realization they can (and should) demand more from the companies whose products they buy or services they use. This awakening has come with the increase in competitiveness and, while the numbers would surely be lower should the above study be carried out here and now in Georgia, awareness and demands are growing and companies need to be ready. By implementing a responsible CSR strategy, companies will find that they are building trust in their products. By being transparent, environmentally friendly and by making a valid contribution to society’s progress, educated customers will be more inclined to choose those companies’ products over a competitor’s, and foreign investors will be more drawn to those companies putting into practice the responsible strategies seen in the West. employer (in gender, age and physical abilities), as this will certainly catch the eye of foreign investors as well as locals. The healthy environs they work in are important- a clean, organized and functional workspace is vital, allowing free movement and an ease of communication between employees of all levels. Workers have lives beyond the company, and this should be recognized, embraced and encouraged for their mental and physical health as well as their productivity. If a new parent is able to work from home, why not? If there is a gym nearby, why not give employees time or incentives to use it? he 6th session of the Georgian-Bulgarian Intergovernmental Commission for Trade, Economic, Scientific and Technical Cooperation was held this past week in Sofia, Bulgaria. The meeting was chaired by Giorgi Kobulia, Georgian Minister of Economy and Sustainable Development, and Bulgarian Minister of Transport, Information Technologies and Communications, Rosen Jeliazkov. The Commission discussed the ongoing and planned reforms in the economies of the two countries, the steps taken in the field of bilateral cooperation, as well as the prospects for cooperation in areas such as trade, transport, agriculture, innovations, technology, and more. The Georgian side emphasized the importance of the transportation sector for bilateral economic cooperation. To fulfill Georgia’s vision of itself as a transport hub, a corridor between Asia and Europe, cargo must move from Georgia’s Black Sea port cities across the Black Sea into a European country on the other side – Bulgaria or Romania. “We agreed that we should study and decide how to make maritime traffic between Georgia and Bulgaria more efficient and more frequent than today. This will help us attract additional cargo,” said Kobulia. The Commission also discussed restoring direct flight routes between Georgia and Bulgaria, which will help develop the respective tourism industries and increase bilateral business relationships. Kobulia also emphasized the significance of the memorandum of understanding, signed between the Chambers of Commerce of Georgia and Bulgaria and the Ministry of Economy’s ‘Produce in Georgia’ program and an equivalent program in Bulgaria. “This MoU will give our businesses the opportunity to deepen dialogue with each other. We plan to conduct a business forum in 2019,” said Kobulia, summarizing the commission meeting. He continued, “In the field of business interaction, we see great potential for the development of textile manufacturing, in which Bulgaria has great experience. Joint ventures could be established. We also see great potential in the manufacturing of furniture, which is also very strong in [Bulgaria] and I think Bulgarian and Georgian companies jointly working together will enable us [both] to enter the export markets more easily. Third – agriculture. For example, a technical cooperation document has been signed for the production of essential oils. Georgia was a major producer of this product in the past, but this sector has disappeared. Bulgaria is now one of the countries with the strongest technical expertise [in producing essential oils] and we have expressed our desire to restore the production of essential oils in our country.” Kobulia called his visit to Bulgaria and the 6th Commission meeting “overall, very successful.” The 5th session of the Georgian-Bulgarian Intergovernmental Commission for Trade, Economic, Scientific and Technical Cooperation was held in Tbilisi in February 2016. During that meeting, officials from both Georgia and Bulgaria signed several bilateral agreements, agreed on sectors of cooperation, and planned to pursue joint investment projects. Then-Minister of Economy of Georgia Dmitry Kumsishvili emphasized the countries’ deepening relations in the sectors of trade and investment, transport, energy, environmental protection, agriculture, tourism and intellectual rights protection. The countries’ national railway companies signed a memorandum of cooperation to share experience regarding railway transport. The issue of restoring direct flights was also raised at the 5th session of the Commission three years ago. y attracting professionals from different walks of life, coffeehouses offer a great space for (sober) intellectual exchanges and innovation, much of which is about connecting ideas from seemingly unrelated fields. Though not alcohol-free, the Georgian supra also played a role in forging the country’s national identity and affecting the ways in which knowledge and ideas traveled across Georgian society. Yet, over the last couple of decades, the supra may have been losing some of its ‘systemic’ qualities, becoming, instead, an occasion for over-indulgence in food and alcohol. * * * According to Steve Johnson (a popular American science writer and media theorist, the author of Where Good Ideas Come From), coffee and coffeehouses were a significant contributor to Europe’s scientific and industrial revolution. The first coffeehouses opened in London in 1650, and quickly mushroomed all over Europe. The coffeehouse had two major positive effects. First, it provided a healthy alternative to water (heavily contaminated) and alcohol (heavily abused at the time). And, second, as more and more intellectuals switched to coffee, the coffeehouse offered a great space to enjoy sober (and, presumably also sober-minded) exchanges of ideas. Meetings between people from different social backgrounds and fields of expertise (e.g. artisans, travelers, merchants and scientists) provided strong stimuli for innovation, much of which, argues Johnson, is about connecting ideas from different and seemingly unrelated fields. For example, Johannes Gutenberg invented the printing press by using the wine press as an inspiration (even before the advent of coffeehouses!). Institutions such as coffeehouses (or modern-day bars) are a very important element of innovation systems in any society. Orhan Pamuk’s My Name Is Red describes how, back in 1623, coffeehouses were banned by the Ottoman rulers in Istanbul (where they flourished well before their European equivalents). This may well have been a factor – or a symptom – of the empire’s gradual decline. ing managerial implications. One can safely bet that supras were effectively used as a “Georgia’s Got Talent” competition to discover (and train) future leaders. Second, the positive (flattering) nature of supra toastmaking may have played a role in overcoming frequent internal divides. Third, one should not neglect the educational (wisdom sharing) aspect of the classical supra toastmaking tradition. Yet, over the last couple of decades, the Georgian supra may have been losing some of its ‘systemic’ qualities, becoming, instead, an occasion for overindulgence in food and alcohol. As a result, modern day supras do not provide as much space for interesting conversations and ‘knowledge diffusion’. “Why is music so loud at Georgian supras?” asked Levan Gigineishivili, a professor at Ilia State University, on a recent TV show. “Maybe we have nothing to say to each other”, was his own answer. exchanges hardly play any role in real ‘knowledge diffusion’. Hardly any of them translate into new ideas or technologies. AND WHAT ABOUT EDUCATION AND CRITICAL THINKING? In addition to an adequate social milieu and institutions, such as coffeehouses, where ideas could be exchanged, innovation requires a serious investment in education. And this is an area where Georgia has seen very little progress after the almost complete collapse of all state institutions in the early years of independence. Georgian youth remain uninterested in science, as is clearly illustrated by the low rates of enrollment in natural and exact sciences. Moreover, Georgia’s general education and private tutoring systems are designed to get (at least some) children over the hurdle of national university entrance tests, not properly educate them or stimulate their interest in science and technology. Neither do our schools do a good job at encouraging intellectual curiosity and critical thinking (see our Outsmarting Laziness: The Most Evil Giant of All Giants). We should also question the role of the most influential social institution in today’s Georgia, that of the Georgian Church. Although the Georgian Patriarch Ilia II often speaks on the merits of analytical thinking, for many rank-and-file priests the teaching of Christianity implies indoctrination. People are taught not to question or critically examine what they learn in church. While it is hard to imagine how one can become a good physicist without questioning the laws of physics, these simple-minded servants of God apparently believe that one can be a good Christian without ever questioning anything Jesus said. It is quite interesting how some other religions operate in the critical thinking and innovation department. For example, knowledge created by Buddhist monks is currently in great demand in many parts of Western Europe. There are numerous iPhone applications teaching people how to do yoga, how to engage in different types of meditation, or how to practice love and compassion. Furthermore, Buddhist monks cooperate with neuroscientists in an effort to advance our knowledge of the brain. Some results from this research have led to important changes in organizational practices. For instance, meditation has been introduced in many R&D institutions in order to encourage creativity and innovation performance. The Georgian Church certainly has the potential to become an agent of social change, particularly when it comes to education. It commands enormous respect and enviable financial resources, yet for the moment these resources are not put to good use. Georgian Patriarch Ilia II often says that a scientist is a friend of God and an illiterate person is a slave of God. In order for the new Georgian generation to be friends rather than slaves of God, we need better education and R&D systems. And, perhaps, not as many new churches and monasteries. ABOUT THE AUTHORS: Eric Livny is Founder and President at Tbilinomics Policy Advisors and Chair of Economic Policy Committee at the International Chamber of Commerce (ICC Georgia). A graduate of Max Planck Institute of Economics, Levan Bzhalava is currently a Research Fellow at Mälardalen University, Sweden, focusing on innovation and entrepreneurship. eorgia is to have an electric car manufacturing factory in Kutaisi, western Georgia. Changan Corporation, the largest electric car manufacturer in the world, will construct its production factory in Georgia. Strategic partners of Changan Corporation include Volvo, Volkswagen and Ford. The production capacity of the plant will be 40,000 cars a year, out of which 50% will be designated for the domestic market, while 20,000 cars will be exported to the European Union (EU). The information was released by the Prime Minister of Georgia, Mamuka Bakhtadze, on April 6, at a presentation of the first industrial business group – Aigroup. The holding, comprising such companies as Aienergy, Aicar, Aipower and Aiproduction, is setting up operations on the Georgian market as the first industrial business group not only in Georgia, but in the Caucasus, and is to launch a variety of eco-friendly projects and investments in a comprehensive manner. In addition, the holding is responsible for the Car Sharing concept, installation of electric chargers and solar energy panels in the capital of Georgia, Tbilisi. A Memorandum of Understanding was signed a few days ago between Aigroup and the Changan Corporation, which is of Chinese origin with a track record of 157 years in the industry. direction of green energy and, of course, our country must be no exception. We are implementing a very important project and anyone in the near future will have the opportunity to use these electric cars," said the Mayor. eet the Head of the Georgian National Tourism Administration (GNTA), Mariam Kvrivishvili, a bold risktaker and innovative female who was unafraid to step out of her comfort zone to contribute to the strategic development of her country. Having moved from the private sector to the public service to face new challenges, she now has to pull Georgian tourism into a new stage of dynamic development. OLD EXPERIENCE NEW CHALLENGE Mariam has had ten years of fruitful activity in the field of tourism, a very solid and varied experience which includes aviation, tour operating and running a hospitality business in both the public and private sectors. Before becoming the Head of the National Tourism Administration, she was the managing partner of the big tour operator ‘Voyager,’ served as the regional manager of the airline FlyDubai in Georgia, and years ago held office as Deputy Head of the National Tourism Administration in the marketing direction. She also worked at Adjara Group in the tourism field. Heading the GNTA turned out to be a great challenge for her and this became her main motivation for taking on this responsible position. Mariam believes that, besides being a big responsibility, this sphere offers numerous opportunities and says it is an honor for her, together with her team, to be able to implement projects in this sector to help her country move forwards. analyze what information they had, then organize meetings with private sector representatives. Her main principals as a manager are teaming up and implementing modern management approaches. She tries to break down any hierarchy in the Administration to allow each employee to get involved in the decision-making process and have direct access to the managers. "It's important for me that the GNTA become more dynamic, creative and fruitful, because tourism itself is all about emotions and interesting experiences." BEING A FEMALE LEADER She says there is a big difference between female and male leaders, and breaking the stereotypes is “everyone’s job” when they hold leadership positions, be it in the private or public sector. "Unfortunately, in our reality, women are more likely to hold back their capabilities, though this stereotype is far from new. It’s good to see more women these days taking on leading roles. It's important for me that people who are able, strengthen their support for having more women involved in decision-making and social processes.” Mariam herself started working at the age of 18 and believes that her career was “a very difficult and long path,” where, as a woman, she had to do double the work and make twice the effort to get respect. greater mobilization of small, medium and large businesses in attracting new investments,” Mariam says. “The next challenge is infrastructural development: arranging municipal roads, arranging cultural sights and so on. We also need to increase the service level; to diversify products and encourage the emergence of niche products; separate business, leisure and medical tourism; and tighten the focus of marketing campaigns so as to create specialized, specific marketing content for target audiences. I think all these directions are equally important and necessary." ENTREPRENEURSHIP She considers the role of entrepreneurship as very important for the field of tourism, and the involvement of local or small and medium entrepreneurs in this area is essential. "Even a Georgian carpet can be seen as a source of tourism revenue," Mariam notes. "The state-run Enterprise Georgia plays a significant role in the promotion of entrepreneurs and start-uppers and it counts among the most successful projects of the Ministry of Economy. The GNTA was also involved in the fruitful promotion of entrepreneurs and creative society within the frames of this program. "There are many who think that what they do has no connection to with tourism. Our role is to show that tourism is also their sphere and to show that, for example, if they work in the medical direction, they can develop within the framework of medical tourism." More opportunity, more employed people and a greater chance of doing business – these are the main goals and motivation of the new GNTA head. strategic development of the country depends on her activities, and, she says, it is necessary to “step boldly.” For Mariam, her job is a unique opportunity to carry out large-scale projects and contribute to the tourism development history of her country. "The risk was high; leaving a 10-year career, the partnership, risking my reputation; but I believe I made the right choice." She believes more in being in the right place at the right time than she does in luck; that capabilities are given to people at a particular moment, and they must be used. She has such an approach to what life throws at her and believes in hard work and continual self-development and education. "Many times, I've experienced that the more you believe in your idea, the greater the chances are to get it done. More – it’s impossible not to succeed. Maybe not today, but in a couple of years the idea will be fulfilled. You should use your abilities in the right place at the right time to reach that goal." THE KEY TO SUCCESS Mariam says that today's ruthless, competitive environment offers success only to good, hard-working and mobilized people. "Work, willpower, the right time and place, and purpose and determination create success. It is also very important to take on social responsibility and promote one another, because the strength and development of a person is directly proportionate to the society around him/ her." Mariam advises that start-uppers, young entrepreneurs and people who are just starting work, first understand exactly what they want out of life. And if they have no answers to this question today, then they should aim to learn, get a variety of experience, come to the idea and then settle short, medium and long-term goals as to how to achieve their ultimate ambition. All of this implies working on yourself, learning and then working some more! he recent report of the World Bank (WB) - Europe and Central Asia Economic Update - reads that this year the Georgian economy is expected to grow by 4.6%, 4.8% in 2020 and 5% in 2021. 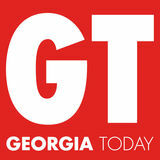 The WB says Georgia’s economy expanded by 4.7% in 2018, driven by strong exports of goods and tourism services and robust private consumption and investment. “Supported by rising investment and prudent economic management, the economy is projected to grow by 4.6% in 2019,” the report reads. It also mentions that real GDP growth is projected to slow to 4.6% this year as external demand weakens and the National Bank of Georgia (NBG) tightens measures to encourage responsible lending. “While newly introduced measures in the banking sector are expected to slow credit growth and private consumption, they will strengthen the resilience of the sector and its ability to sustainably support the economy,” the report reads. The outlook says that inflation will remain low, anchored by the credible monetary policy of the NBG. “Fiscal operations will continue to shift from current to capital expenditures in the medium-term, while efficiency improvements will create some additional fiscal space for higher capital spending. Public debt is projected to stabilize around 43% of GDP by 2020,” the report reads. gia’s financial system, the report says Georgia will remain vulnerable to regional developments and the risks associated with a sharp decline in export demand or a reduction in remittance inflows. “While the Russian economy has withstood external shocks and the Turkish economy has begun to stabilize, a fresh round of disturbances in either economy could undermine Georgia's prospects for tourism and investment, complicate access to financial markets, and negatively impact economic growth,” the report reads. Ivane Matachvariani on Financing Education Matchavariani stated that according to the growth of the country’s GDP in 20202022, the total budget of the education sphere will reach 3.4 billion GEL. “Various studies demonstrate that we have a low indicator in the general education direction on both the regional and global scale. This means that the functions of schools need to be fundamentally revised. More independence should be provided in the knowledge obtained at school and the school certificate should be given much more importance,” he said. The Minister focused on the importance of improving school infrastructure, augmentation of the qualification of teachers and provision of teachers with the relevant salaries. “Construction of new schools, as well as the modernization of current infrastructure, is vital, necessitating major finances. These expenses are envisaged in the budget. The number of pupils per class is certainly one of the major components and it is of crucial importance to establish modern standards in this regard. It is also significant to interest youngsters and motivate them in terms of starting work at schools in future. The profession of a teacher has to be one of the most popular in the country. That is why implementation of these components is the key for the success of these reforms,” Matchavariani concluded. unding of the sphere of education will gradually increase to 6% of the total GDP of our budget by 2022, stated Ivane Matchavariani, the Minister of Finance of Georgia at a briefing held after the governmental session on April 4. The Minister noted that as a result of the government initiative, a project of changes has been prepared for the legislation about the budget, according to which it is obligatory to prepare and approve a governmental budget project in such a way that the funding of the education system is not less than 6% of the total GDP for the upcoming year. Matchavarinani also stated that education is set as the major priority for the government. “The budget for 2022 should be set in a way that 6% of the GDP is spent on the education sphere. In order for funding to reach this value, it is important to increase financing gradually. The financial assistance for the education sector will reach 2 billion GEL by 2020, 2.5 billion GEL by 2021, while it will exceed 3 billion GEL by 2022. General, preschool, and professional education will represent the main directions of the reform. The budget for higher education and sciences will also be increased,” noted the Minister. to local companies such as hotels or restaurants by bringing large numbers of visitors. The panel of presenters gathered five guest speakers from Estonia, who came to talk about the success and challenges of the creative economy in their own country. Then, representatives of Georgian festivals talked about their own experiences. Different subjects were addressed, including branding, financing and space management. The main challenges encountered when organizing festivals were noted to be finding a stable source of funding, reaching an audience, dealing with weather conditions, facing competition and managing unexpected situations. throughout the city. It is one of those rare high-quality festivals that people can enjoy for free. Other guests presented the Sou festival, Tbilisi International Festival of Theater, Tbilisi Architectural Biennale, the Blues Fest and CinéDOCTbilisi, all very inspiring cultural events set to happen again this year and that participate in making Tbilisi and its surroundings a growing cultural hub. Such festivals attract a young and dynamic population to the city, educate people and more than anything, make arts reachable for anyone. Georgia needs to put more emphasis on events of this type and in diverse cities. ndrew Jefford, a well-known British wine writer, held a Georgianwineseminar"Why Georgian Wine Is Important" within the exhibition "Georgia-Homeland of Wine" in Tokyo. Andrew Jefford spoke about the importance of Georgian wine, the varieties of Georgian vines, the appellation of origins of Georgian wines and the varieties characteristic to Georgian regions. The English writer emphasized the importance of Georgian wine, noting that Georgia had introduced a new category: Qvevri wine. The following wines were presented at the seminar attended by Japanese wine experts: "Tsinandali 2016" (Tsinandali Old Estate), "Khikhvi, Qvevri 2017" (Shalvino), "Mtsvane, Qvevri, Iberiuli 2016" (Shumi), "Krakuna, Qvevri, 2015” “Winery Khareba”, “Tavkveri 2016” (Chateau Mukhrani),”Qvevri, Saperavi 2017 "(Teleta / Orgo)," Tamada, Grand Reserve, Red Saperavi 2014 "(GWS). Andrew Jefford has visited Georgia several times. In his own assessments, he describes Georgian wine as "high quality" and says he considers wine to be the most important product of Georgia. "Who can refuse to taste the wine of the country that is the homeland of wine and has eight thousand years of wine history?" Jefford asks. Jefford 's event was held with the support of the Georgian National Intellectual Property Center "Sakpatenti". The project "Georgia – Homeland of Wine," organized by the National Wine Agency and Association "Georgian Wine" is implemented by Sony Music Communication and the company TOPPAN partnership. The exhibition combines unique archaeological exhibits and modern technologies, the concept of which is based on the uniqueness of Georgian wine culture. Exhibition "Georgia – Homeland of Wine" was opened on March 10 in "Terrada Warehouse" and will last until May 7.
policies and create economic opportunities for the rural population outside of agriculture. he 6th Wings for Life World Run, the largest charity event in sporting history, is to kick off on May 5, at 15:00, at the turn to Lopota Lake on the Telavi-Kvareli Highway. muscles. Five months of exercise later and they were able to walk totally unaided. The next stage of the research is to use the electric stimulator at the early phase of nerve damage, where there is a higher chance for the restoration of health. The Wings for Life World Run’s popularity and success is in no small part thanks to the World Run Ambassadors. Famous sportsmen will have the role of Ambassadors this year: Maia Azarashvili, the winner of the Seoul Olympiad prize in sprint (the Sports Director of the event); Rezi Rogava, basketball player; Varlam Liparteliani, silver winner of the Rio Olympics; Olympic Champions Vladimer Khinchegashvili (wrestler) and Lasha Talakhadze (weightlifter); racing drivers Mevlud Meladze and Data Kajaia; Iva Tsiklauri (skier); Vasil Lobjanidze, rugby player; Irma Khetsuriani, wheelchair fencer; Henri Kuprashvili, swimmer; amateur joggers Giga Dzuliashvili, and Tamar Gelashvili. Aside from sportsmen, there are Ambassadors from other fields: Giorgi Baqradze, intellectual; Elene Kalandadze and Achiko Guledani, musicians; TV hosts: Mariam Vashadze, Alexander Lortkipanidze, Irakli Kakabadze, Irakli Gaprindashvili, Nika Grogolia; public figures: Keti Khatiashvili, Ninutsa Makashvili, Mirian Jejelava, Merab Dukashvili; Nino Goguadze, fitness instructor; Mari Nakani, photographer and others. QUICK FACTS ABOUT THE WORLD RUN 2018 • 7,000 participants were registered for the World Run in Georgia in 2018; • The World Run was held on 200 locations in 66 countries in 2018. 100,000 participants covered 934,484 kilometers in total; • Nina Zarina (47,45 km) and Alexander Cheburkin (74,728 km) were the local winners of the World Run 2018. They will run in Australia in 2019; • Aron Anderson, who covered 89,58 by wheelchair and Vere Nunis (53,78 km) were the global winners last year; • The winners of different countries ran in Georgia in 2018: Giorgi Shekrelidze from Georgia (35,43 km), Sebastian Hallmann from Germany (68,47 km), Veysi Aslan from Turkey (57,51 km), Iosha Zakrzhevki from Poland (52,26 km), Iana Khmeleva – the winner of Kakheti 2016 (34,95 km) and Anatoli Oleinikov – the winner of Kakheti 2014-2015. The charter flights arrive and depart from Tbilisi International Airport. Korean Air ran chartered flights on the Seoul-Tbilisi route for the first time in May 2018. Multiple airlines are opening new routes to Georgia this year. Air France conducted its first direct flight to Paris on March 31 and Smartlynx Airlines will launch charter flights between Tallinn and Batumi this summer. he Minister of Finance of Georgia Ivane Matchavariani held a meeting with Matteo Patrone, Managing Director of the European Bank for Reconstruction and Development (EBRD) and Catarina Bjorlin Hansen, new Regional Director of EBRD for the Caucasus Thursday. gia through increasing investments and by supporting new reforms. At the meeting, the parties discussed the ongoing projects carried out with the assistance of the EBRD. In addition, the representatives of the bank noted that the EBRD will support Georgia in a number of spheres, including education, transport, infrastructure and power engineering. Hansen officially assumed her role on April 1. She replaces Bruno Balvanera, who has been named EBRD Managing Director for Central Asia. underway with the NBG regarding the issue. The new banking regulations took effect in Georgia on January 1, 2019 meaning that people will not get loans from banks if there are no solid guarantees that they will be able to pay it back on time. CI-Paris, one of Georgia’s leading perfume shops, has been putting the quality of products as among their major values since 1995. It has now launched a new fragrance of the prominent Hermes brand for its Georgian clientele: ‘Un Jardin sur la Lagune,’ which is set to mesmerize customers with a marvelous blend of scents. It was developed by perfumer and Hermes’ esteemed ‘nose,’ Christine Nagel. While working on the fashion house’s new fragrance, the sixth in the ‘Le Jardin’ range, Nagel found her inspiration in a secret hidden garden with an intriguing name: The Garden of Eden, located on the Venetian island of Giudecca. However, as it is permanently closed to the public and has as such obtained almost a mythical status, Nagel had problems getting in! After numerous denials to her request for permission to enter the prominent garden, the perfumer directly addressed the president of the foundation in ownership of the Garden of Eden, explaining the reasons for her desire to visit. Her request was granted and Nagel was allowed to walk into the garden and work on the fragrance. The perfumer recalled the working process, which started on a cold winter’s day, and the difficulties she had to face. However, she also focused on the wonderful plants she had a chance to discover in the Garden of Eden. Nagel spent over 18 months translating multiple scents from the surrounding lagoon and the greenery found in its vicinity, transforming them into a single perfume: a sophisticated blend of jasmine, magnolia, Madonna lily and orange blossom, offset by woodier notes. The perfumer noted that creating this fragrance meant giving new life to the ‘mysterious’ garden and enabling travelers to finally discover its treasures.